The beautiful brick exterior of 251 Central Ave is an eye catcher to all who drive by it on Central Avenue. This building has multiple office suites, some one room, some two room, some three room. Cleanly heated by natural gas, 251 Central Ave has central air conditioning, beautiful wood floors, and parking on site. There are currently no vacancies at 251 Central Ave. Beautifully renovated office suites in historic Pierce Street School, 16 Pierce Street is a luxurious premium professional office building. This two story brick exterior building has four office suites, each consisting of four rooms; three private offices, and one reception room. Each unit has a private bathroom and three parking spaces. The building has central air conditioning, 10 ft ceilings, and on-site parking. ​There are currently no vacancies at 16 Pierce St. 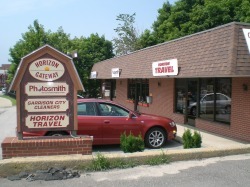 Situated on busy Central Ave and the Gateway to downtown Dover, 263 Central Ave is the longtime home to both Horizon Travel and The Photosmith. This one story building has three suite retail building suites with beautiful views of the Cochecho River and the Dover Mills. There are currently no vacancies for 263 Central Ave.